Above: Tesla’s “smooth” style solar roof. These solar roofs will absorb sunlight, turning it into electricity for personal use at your home. They work with a special Powerwall battery that stores the energy for you, making the energy available any time, even at night. This will be especially useful during grid outages! All your neighbors will be lights out during a storm, and you’ll be enjoying your life uninterrupted. Above: Tesla’s “French Slate” style solar roof. Tesla began accepting pre-orders in May 2017, and installations are supposed to begin in June 2017 in California. Right now, there are two styles available to order: textured and smooth. Tuscan and slate styles will be available early next year. The roof tiles are made of tempered glass, making them more than three times stronger than traditional roof tiles. 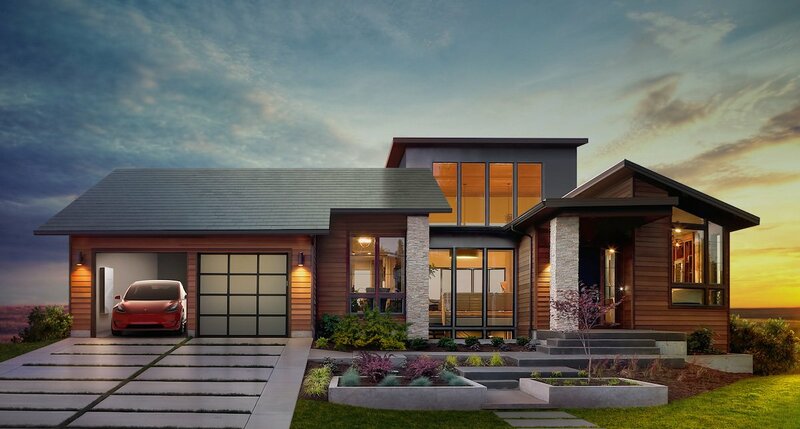 These tiles are so strong, Tesla is actually offering an “infinity” warranty on their roofs, guaranteeing them for your life, your childrens’ lives, and your great-great-great-great-great grandchildren’s. As for the cost, Elon Musk was very vague at first, only promising that the roofs will be excellent value once you start saving money off your electricity bill. However, Musk has been recently quoted saying the roofs will be very comparable in price to that of a standard roof. Keep in mind, he wasn’t talking about the ultra-cheap asphalt roofs most of us have, but the Tesla roofs will still be an excellent investment to make. Above: Tesla’s “Tuscan” style solar roof.